verb (used with object), adored, adoring. to regard with the utmost esteem, love, and respect; honor. I simply adore the way your hair is done! verb (used without object), adored, adoring. And what is not to like about it? Just look at that dial! Gorgeous! The Adorex line was made starting from 1974 up to about 1977? The watch presented here is a 35mm NOS example, still with the price tag (JPY 16,000 at the time, February 1975). All made of stainless steel, with matching bracelet and Citizen signed clasp. It has a beautiful blue “fish scales” dial that looks different depending on the light source. My watch is powered by the Citizen 8050 21J movement working at 28,800bph. With this calibre Citizen used for the first time the unidirectional rotor needed for automatic winding. It was made for two years and can be found only in the Adorex watches. 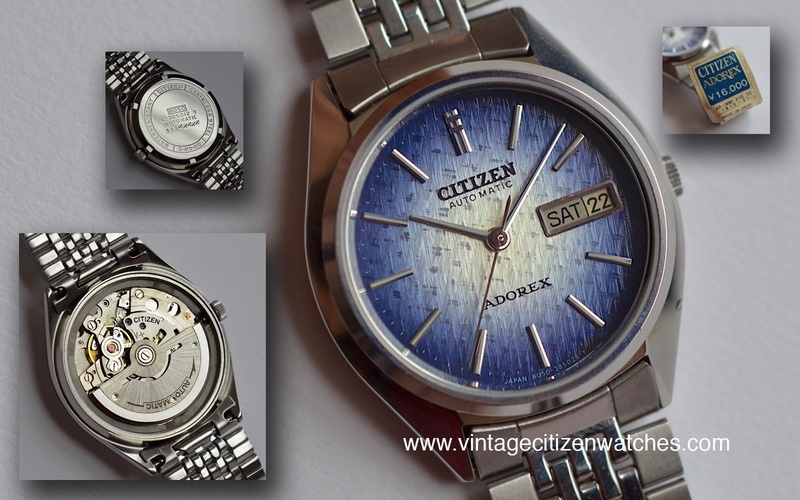 There is one more calibre to be found inside the early Adorex range, the Citizen 8000 with 25 Jewels. Both have a sweeping central seconds hand and display both the day and date. The 8050 has a few more cool features I will talk about later. Of course, as most of the times, the watch can be manually winded too. When pulling the crown out one position you can change turning it one way, while turning it the other way will advance the day. On this one you can see the day is bilingual (Japanese and English) with red printing for Sundays. Later on you can also find calibre 8200 inside, somehow with a a similar look but different architecture. I found this article, written in German, with a lot of interested details about the 8050 calibre inside a similar Adorex, HERE. Take a look! Bottom line, a beautiful and interesting watch to be worn and loved!